As a journalist covering emerging technologies and as a Web entrepreneur with my own start-up, I am often required to test various products and services that come across my desk. More often than not, the Web apps or services that I am asked to review are simply not addressing real pains or offering big enough improvements on existing products; others are too difficult to set up and would require adapting to new habits that neither my readers nor I would be willing to embrace. But many are well worth investigating and in many cases, implementing promptly in your business process. The following is a short list of my favorite four most-recently-discovered tried and true start-ups. Two of them, LocBox and User Testing are based in Silicon Valley, AppSumo is based in Austin and Yast is located in Norway, proving that start-ups can thrive everywhere. Yast. Time waits for no one. LocBox. Show me the love, I'll show you the money. LocBox. Headquartered in San Francisco, LocBox is an effective online marketing platform and e-marketing service which differentiates itself from discount sites by focusing on your existing customers, both active and inactive, instead of trying to convert deal seekers into new customers. It is a customer retention and loyalty system for local businesses. LocBox team believes that showing the love to your existing customers base with great discounts is going to result in increased business. Happy customers will speak nicely about you and are the most important marketing assets in your arsenal. By offering discounts not available to all, you reinforce your relationships. LocBox books, confirms and collects payment on your behalf, all you have to do is fill in a form, tell your story and share the good news.You can also connect your Facebook Fan Page to your LocBox merchant account. The first trial is free. Once your trial is over, you can pick from three different packages starting at $49.99 per month. And it offers superb customer service. LocBox is venture funded but has not made public the amount it has raised. It is part of Google Venture. AppSumo. A penny saved is a penny earned. Like the girl next door, I love a good deal and am always looking for the best ones in town. Be it shoes, jeans or a mobile app, if I can spend less for the coveted item, I’m buying. AppSumo located in Austin, takes the approach that you don’t need to wait for your seed money or for miraculous angels to get the ball rolling. What you need to do is to partner with the right services at the right prices. AppSumo offers Web apps and digital goods for technology geeks at discounted prices on services that as a small business owner or simply a student of life you may actually use. To register, you sign-up to their daily emails and will receive discounted products that range from learning HTLM5 in seven hours to writing better copy, and designing WordPress themes for passive income. So far, I have purchased two services and I am quite satisfied with the quality of the products received. The satisfaction guarantee policy seals the deal for me. AppSumo prouds itself in being self-funded besides receiving a little help from Noah's mom. User Testing. How good are you? One service that I discovered through AppSumo is Mountain View, Calif-based User Testing. It provides on-demand usability testing and quick response. I love it. It came to my attention at the exact right time since I am in the process of designing and integrating RushPRtools into RushPRnews and I am in dire need of objective feedbacks. For under $100, I picked five testers to try out my platform as it is now. The conclusion is that it needs a lot of work but at least now I know where to put my focus. I liked that I could select the participants from a pool of different level of web abilities, industries and even countries. I designed my test, and received the results within one hour of submission. The summaries were delivered in the form of a video and a written report, which I could then share with my team. The videos were the most useful. It allowed me to track every movement and actions taken by the testers and identified the stumbling blocks. The cost per user is $39. There are many more start-ups worthy of VatorNews' investigation and I will make sure to keep you updated on my upcoming discoveries. One quick final note, Research In Motion(RIM) sent me a PlayBook 2 tablet to test out and this article was entirely written, and researched using it. The PlayBook makes it easy to multi-task, and to go back and forth between your browser and the keyboard. One major downfall is that many of my favorite applications have not been developed for the PlayBook yet. Not even Skype, which is a shame since it has such a nice front-facing camera for chatting. Oh well... But it's a thing of beauty and its portability makes it most practical. 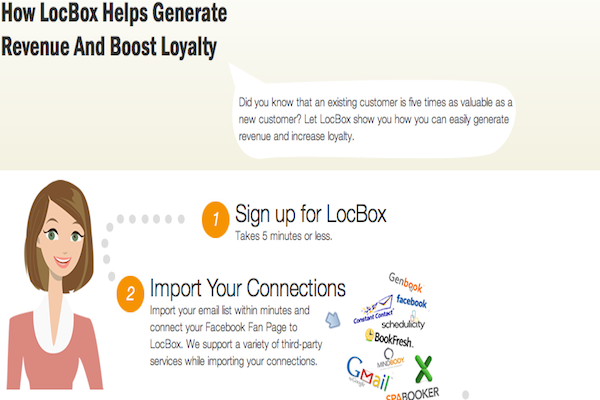 LocBox is a customer retention network for local services businesses - plastic surgeons, medical spas, golf courses, gokart racing tracks, bed and breakfast hotels, etc. We help our 400-odd customers generate foot traffic and revenue from their existing customers with multi-channel (email, facebook, twitter, text) marketing campaigns. Yast is a time tracker application delivered as a SaaS app and is used by freelancers and up to medium sized businesses. While several time trackers consider them selves as easy to use, Yast has focused on the user experience and has received attention from several blogs for its user interface and experience. The founding team is five engineers studying together at the university and decided to make "something" before graduating. The result was Yast. The company strategy has been "Born Global". Headquarters are located in a small town of Norway called Sogndal, but the majority of the users are from the US. Having spent most of the time in the startup phase working on the product, focus is now shifting more towards market communication, moneytizing and partnering. We know usability testing is a pain. It’s expensive and time-consuming. As a result, it doesn’t happen enough. That’s why we built UserTesting.com — we wanted to bridge the gap between no user testing and expensive user testing. UserTesting.com lets you “look over the shoulder” of people in your target audience while they use your website. We make it fast, easy, and inexpensive, so you’re more likely to do it.